The Renault Caravelle is like a French Karmann Ghia but not as desirable. This Renault has been on Detroit Craigslist for months and finally the seller has added some fuzzy pictures to generate interest. From the rust in the pictures, I can see why they might be counter productive. The underside must have holes like a Kwame Kilpatric cover story. 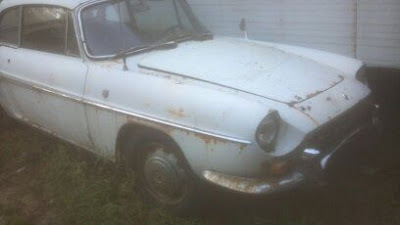 Previous ads listed a price of $1100 and some suggested swapping the running gear into a less rusty body. I've always disliked the idea of parting a running car but most likely the body is beyond salvaging. For a few hundred dollars, this could be well bought parts car.